Go West, Young Man: Are Pro Sports Conferences Imbalanced? For sports fans out there who don’t limit themselves to just one or two sports, a pattern has been emerging. In the NBA, it’s been going on for years. In the MLB and NFL, it wavers but always returns. And in the NHL, with recent realignment stacking three divisions and significantly weakening one, it’s something of a new phenomenon. I’m talking about the sheer dominance of Western based teams. What is the deal with the West? NHL, NBA, NFL, MLB; it doesn’t seem to matter. The West has been dominant, not just this year but like no other collective division in sports. Don’t believe it? Listen to the experts. There you have it! Four completely different sports, operating in a variety of different markets – it seems like it all must be a giant coincidence right? Well maybe. But maybe not. Let’s take a look at some of the factors that have led to this unparalleled shift in sporting dominance. 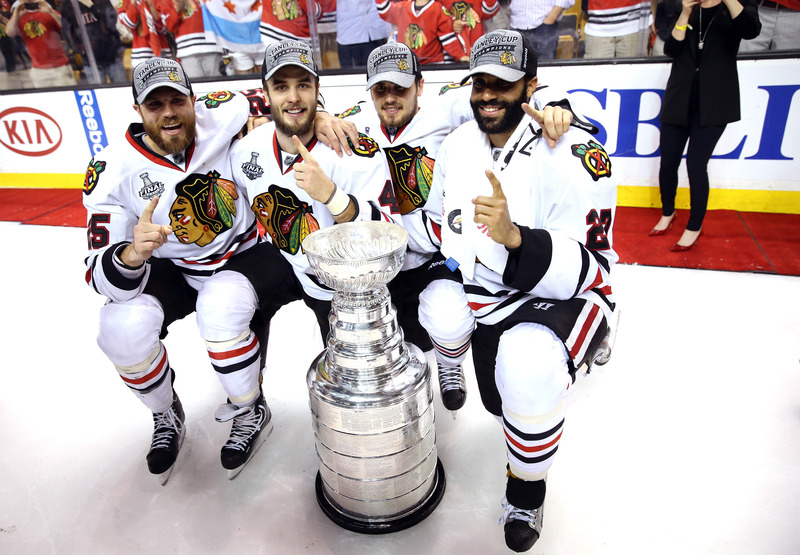 The Blackhawks celebrate with the Cup. And they had to go through the Western Conference to win it. What Does ‘West’ Mean Anyway? Generally people only think of California/Texas/Seattle and the Southwest when considering Western Conference teams. But if you skim through the ‘Western’ divisions in the four leagues, you come across some different names. 1. The Denver area is most prominent one; they have teams in all four major North American leagues, all in either the Western Conference or division. If you look at a map, Denver is way further West than I thought! Good for you, Denver. 2. Minnesota is featured in the NBA and MLB, but in Central/Northern divisions in MLB and NFL. 3. Kansas City is in the AFC West but is also featured, more appropriately in the AL Central. 4. Ditto for St Louis in the NFC and the NL Central. 5. Oklahoma City and Portland both feature only NBA teams and both are included in the West. 6. Detroit and Chicago are all over the map, depending on the sport. They’re both in the NFC North for the NFL, the American League and National League Central in MLB, and until recently, both featured in the NHL’s Western Conference. The Red Wings have ping ponged back and forth, playing in the NHL’s Eastern Conference in the 1980’s, then moving West and finally moving back East again this year. The Blackhawks, despite bordering a Great Lake, are still in the NHL’s Western Conference. But hey, the Toronto Maple Leafs also played in the Western Conference for about 12 years, so who can judge? Besides people with eyes and maps. Now that we know what we’re dealing with, let’s take a look a some of the things that might have contributed to the success of these teams. A caveat: obviously every team is different. Player development, scouting, coaching, ownership are the most important factors in a teams success. What I’m looking for here is a possible silver bullet, a reason why the West has come to dominate so heavily. Sound good? I thought so too. 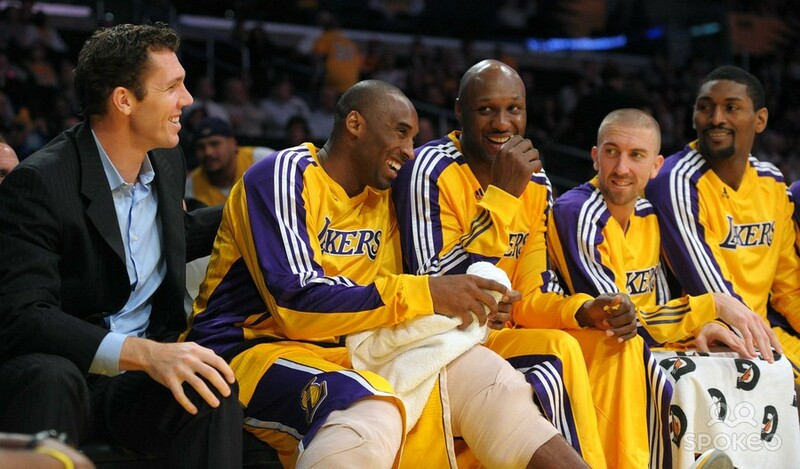 Players like Lamar Odom (seen here with Kobe, NBD) want to play near a beach. Perception: A large majority of the Western Conference teams in all four sports operate in the American Southwest, Texas and California. These are beautiful locales that are going to be popular destinations for free agent players, regardless of their background. We hear a lot about the players who care only about winning; a lot of them care about beaches and BBQ too. And don’t forget executives. Do you think team execs, who are generally a bit older and have wives and families, would rather live in LA/San Fran or Jacksonville/Memphis? It’s a real factor. Let’s call this one a draw. It might be a factor in some cases but it’s definitely not the make or break point on a wider scale. Perception: Many players enjoy playing in Texas because there is no state tax, lax gun laws, big pieces of meat and plenty of endorsement deals due to the giant cities of Houston and Dallas. The Problem There is: It’s not a problem with Texas so much as the fact that this same thing is offered by Florida, which is generally included in the Eastern Conference and would seem to offset any geographical advantage. Texas has nine teams in the four major leagues; Florida has nine as well. 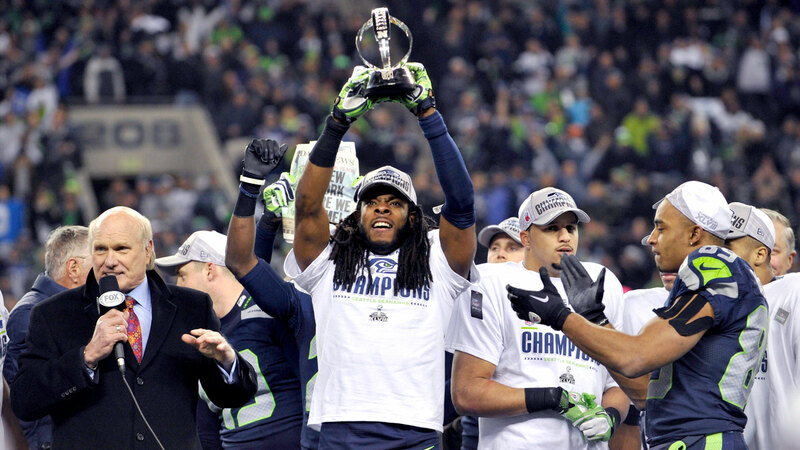 The Seahawks win in the Thunderdome, errr, the Super Bowl. Perception: Here is where things get interesting. Los Angeles is the second biggest television market in professional sports. Houston, Dallas, Phoenix and the Bay area are also massive draws. Big cities mean large populations which means big television money. This means teams generally have more money to spend on their product. The NHL is the only league to feature a hard salary cap, meaning teams cannot exceed it for any reason. The NBA and NFL feature a similar system with a luxury tax, where teams can go over the salary cap for a variety of reasons; teams are generally more willing to do this if they have favourable television deals and money pouring in, as they penalized financially for doing so. MLB doesn’t have any kind of restrictions on salaries, beyond a loose team threshold (close to 200 million per season) after which teams need to pay tax to the lower spending teams in the league. In other words, if you got the skrilla, go dancing. Check out the newly flush Los Angeles Dodgers, who just signed the richest television deal in the history of North American sports. They’re obliterating Major League Baseball’s soft tax threshold and increasing their spending each season. Not far in the rear-view are their friends in the American League, the Los Angeles Angels and Texas Rangers. If you look at the NBA, the Lakers and Mavericks ranks among the most consistent teams to pay the luxury tax. In the NFL, the 49ers are one of the leagues most storied franchises, the Broncos are a current superpower and the Seahawks just won their first Super Bowl. In the NHL, the Los Angeles Kings and Anaheim Ducks have won titles in the past few years, becoming the first California based teams to do so. The San Jose Sharks have emerged as a consistent contender with a dedicated fan base and committed ownership group. The Problem There is: Nothing really. This is undoubtedly a major reason why so many Western Conference teams are becoming so successful. Money talks. These teams are supported by the fact that where they’re located geographically makes living in major cities a necessity, which lends them the ability to push the limits of their sport. The East features New York, Boston, Toronto and Chicago, but when you couple it with other factors, the West almost certainly gains an advantage here. 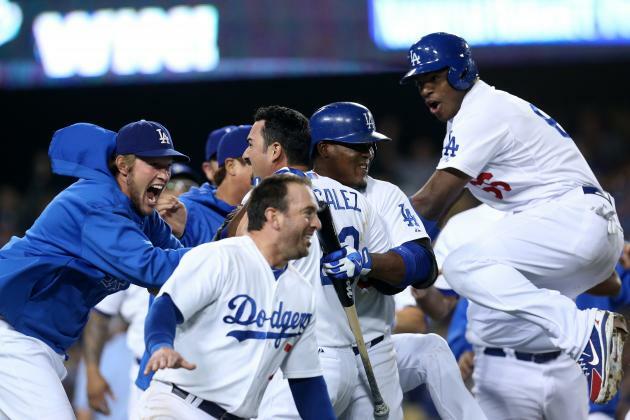 The Dodger players can’t believe how much money has been spent on their team. Very well! In the past 20 years, 78 championships have been awarded in the four major North American sports (both MLB and the NHL missed a title). The West has won… drum roll please… 11 of 19 Stanley Cups, 5 of 20 Super Bowls, 4 of 19 World Series and 12 of 20 NBA titles, for a total of 32 out of the 78 titles. In the past ten years, this number is 14 out of 39, or just over a third. When you consider there are six divisions to draw from in both the NFL and MLB, it appears that the West is clearly over-represented, if only slightly. The thing is, this trend is something that is only increasing. The eighth seed in the NBA’s Western Conference might have a better record than the 3rd seed in the East. The Dodgers and Rangers are poised to be long time powers in MLB, to say nothing of the free spending Angels, and the San Francisco Giants, who won two World Series in the past four seasons. The Blackhawks, already mentioned, are hockey’s closest thing to a current dynasty and they play in the West. All Western teams have had success at times; never have they all been so successful at one time. It remains to be seen if the trend continues. But to me, this feels like the beginning of a larger conversation. Thanks for the comment Nick! If you add up the cumulative teams, there are 122 in the 4 major leagues. 48 are classified as ‘Western’ teams. Same goes for East. 26 are either North, Central or South. In the past five years, 14 of 39 championships are West, 13 are East and the other 12 come from the randoms. So you’re right, it’s a pretty even split. However, if you look at overall records, team money and the direction that the money is trending, it shows a definite push towards the West. The other thing to consider is that in past, things were SO heavily dominated by the East… just look at the all time champions (Yankees, Habs etc…) that the fact that the West has drawn completely even proves that it’s trending upwards.